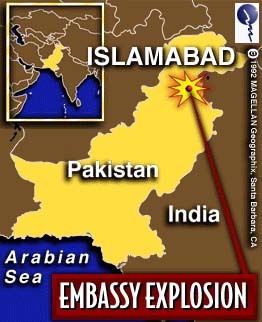 ISLAMABAD, Pakistan (CNN) -- A car bomb explosion Sunday morning outside the Egyptian Embassy in Pakistan destroyed the face of the building, killed at least 13 people and wounded dozens more, both inside and outside the building, Pakistani officials said. (900K QuickTime movie) At least one Egyptian diplomat and three embassy guards were reported among the dead, but Egypt's ambassador to Pakistan, Mohamed Noman Galal, was not in the building at the time. A militant Muslim group in Egypt, al-Gamaa al-Islamiya, which means Islamic Group, claimed responsibility for the blast that rocked a high security area of the Pakistani capital at 9:30 a.m. local time (0430 GMT). Egyptian officials were reporting at least 15 deaths, but Pakistani police and hospitals put the number at 13. 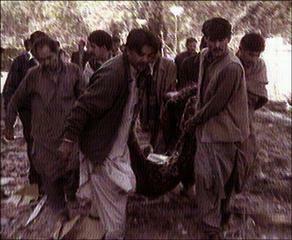 Interior Minister Naseerullah Babar told reporters the explosion was a suicide car bombing. Pieces of debris and human flesh were scattered up to 50 meters (160 feet) from the embassy. The blast tore a crater about six meters (20 feet) wide inside the embassy compound, ripping off the whole facade of the two-story building and wrecking several parked cars. Windows of nearby buildings, including a French embassy school, were shattered, causing minor injuries. An estimated two dozen vehicles were damaged or destroyed. Most were just turned into torn shrapnel. Sunday's bombing was Islamic Group's fourth attack on Egyptian targets outside the country. The militant group tried to assassinate Egyptian President Hosni Mubarak in June by ambushing his motorcade as he arrived in the Ethiopian capital of Addis Ababa. After Egyptian police shot dead a Gamaa military leader they believed trained the would-be assassins a week ago, the outlawed group warned it would retaliate by escalating its attacks against government targets. The bombing comes 10 days before Egyptians go to the polls to elect a new lower house, the People's Assembly.